Let ABCD be a convex quadrilateral. Let P be the point outside ABCD such that angle APB is a right angle and P is equidistant from A and B. Let points Q, R, and S be given by the same conditions with respect to the other three edges of ABCD. Let J, K, L, and M be the midpoints of PQ, QR, RS, and SP, respectively. Prove that JKLM is a square. Putting it a little differently, let ABP, BCQ, CDR, and DAS be right isosceles triangles, with right angles at P, Q, R, S. Let J, K, L, and M be the midpoints of PQ, QR, RS, and SP, respectively. Prove that JKLM is a square. Let ABP, BCQ, CDR, and DAS be right isosceles triangles, with right angles at P, Q, R, S. Let J, K, L, and M be the midpoints of PQ, QR, RS, and SP, respectively. Prove that JKLM is a square. 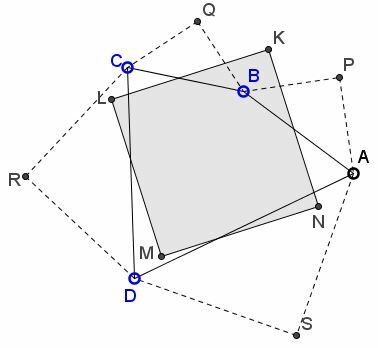 By van Obel's theorem, the diagonals PR and QS are equal and perpendicular. Lines KL, LM, MN, NK are the midlines,midlines,altitudes,medians,angle bisectors of triangles PQR, QRS, RSP, SPQ, so that KL = MN = PR/2 and LM = NK = QS/2. Since KL ⊥ LM, etc., KLMN is a square. A theorem by Jesse Douglas shows that the order of the two operations: 1) forming right isosceles triangles and 2) taking the midpoints, is not important. A square pops up regardless of the order in which the operations are performed. This also follows from the results of Varignon and Thébault.